A Turkish Passenger plane (Pegaus Airlines Flight) packed with 162 passengers and crew members came within yards of plunging into the Black Sea when it skidded off an icy runway while trying to land, The Sun UK reports. 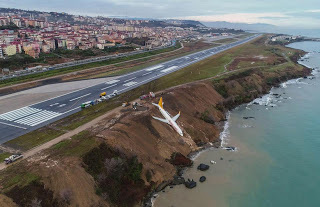 Luckily, the jet's 162 passengers escaped death nor injury when the wheels of their Pegasus Airlines flight dug into the freezing mud at Trabzon Airport, leaving it dangling precariously off a coastal cliff. Photos appear to show smoke billowing from the cabin but Trabzon Governer Yucel Yavuz said all 162 passengers and crew on board were evacuated safely. 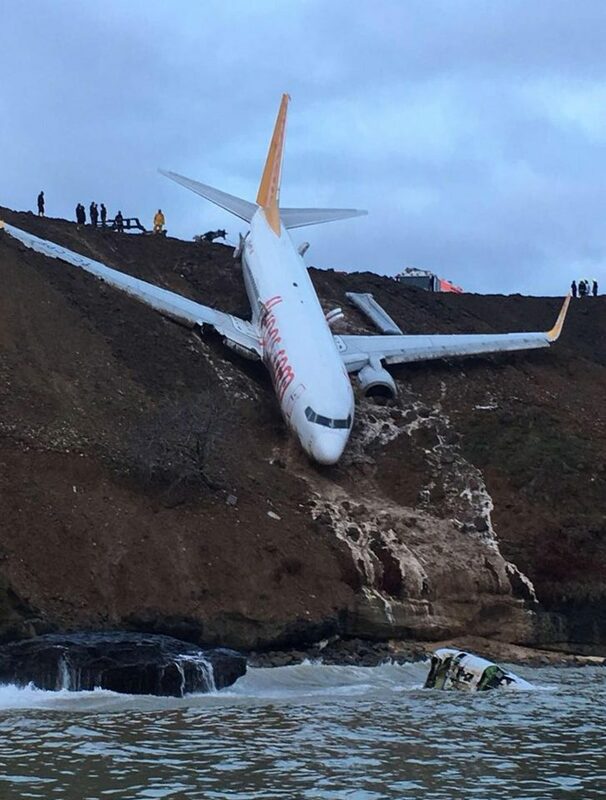 The plane which left Turkish capital Ankara on Saturday night stuck firmly in the mud as a solitary lighthouse illuminates the chilly water. It is however safe to say that icy mud played the hero and more than 162 deaths were averted. 0 Response to "Turkish Airways Crash Lands, Skids Off Runway, Almost Plunged Into Black Sea"